Global trends such as Industry 4.0 are transforming the traditional methods deployed to extract ore from rock. Mining operations are instead looking at innovations such as automated drilling in high risk areas underground to enhance safety. This is where software solutions like Pitram from Micromine can assist mining operations to automate, and thereby boost efficiency dramatically. As a leading software solutions provider for the mining industry, Micromine strives to stay ahead of the curve in terms of trends such as Industry 4.0, commonly referred to as the Fourth Industrial Revolution. Industry 4.0 refers to the current trend in automation and data exchange in manufacturing technologies, including cyber-physical systems, IoT, cloud computing and cognitive computing. According to global marketing manager Kate Gilbey, there is an ongoing trend towards increasing automation and even AI to assist mining operations in terms of smart optimisation. In an industry such as mining, where improving productivity is crucial to profitability, even small improvements in yields, speed and efficiency can make an extraordinary impact. AI and machine learning can assist mining companies to find minerals to extract, a critical component of any smart mining operation. Although AI and machine learning are still relatively new in the mining industry, many companies are excited about the prospect of being able to reduce personnel risks, obtain real-time data and make processes more efficient through these types of advances. 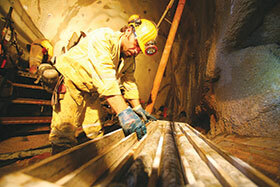 “As a client’s operation evolves and needs change, our solutions can be adapted to evolve with the mine. This represents a capital saving to clients, as they can continue using elements of their original, familiar application. Our solutions span the entire mining process, from exploration through to mine production, and cater for all mining operation needs through the provision of our suite of products, friendly and customer-driven staff, services and post-implementation support,” she explains. Micromine’s research and development teams work around the clock to forecast what its clients and future clients will need in their software toolkit. “This means we have to think about where the industry is going. Our products are evolving constantly. Every major update comes with multiple service packs to fine tune that product,” Sternslow adds. Using the processes of computer vision and deep machine learning, onboard cameras are placed on loaders to track variables such as loading, hauling, dumping and travelling empty time. The video feed is processed on the Pitram vehicle computer edge device, following which the extracted information is then transferred to Pitram servers for processing and analysis. In environments where network connectivity is intermittent or does not exist, field computers become critical for computations and integration. Geobank Mobile is designed to operate in this edge computing environment. It has the ability to integrate directly with field measurement devices to deliver a practical and efficient solution to the user. “An exciting new development in terms of Geobank Mobile is its integration with DSLR cameras to capture imagery of the drill hole core,” Gilbey continues. For example, AngloGold Ashanti Australia is using this technology with a camera mounted to a mechanised track that sits above the chip tray. It automatically takes photographs of drill hole geological chip samples. Through seamless integration, these photographs are fed from the camera to the Geobank Mobile solution, which has been configured to rename the file based on the hole identifier.